Green tea is one of the most discussed foods in recent times, although the Chinese have known the medicinal benefits of it since ancient times. Its origin is in China, but is produced in many countries now. Green tea is produced from leaves of the plant ‘camellia sinensis'. Out of the 3 varieties of tea (green, black and oolong), green tea is the least processed variety and so provides many antioxidants, tannins, and flavonoids. Green tea will not add up to your calorie consumption! It has very small amounts of many other nutrients but is high in antioxidants. You can use green tea in many recipes and enjoy the benefits. 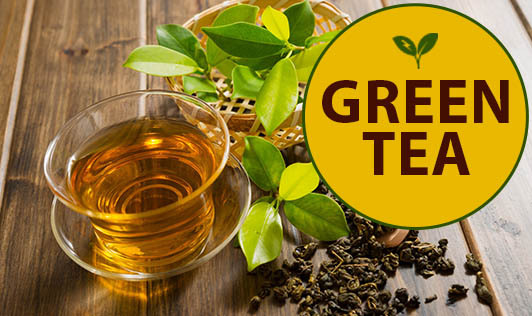 The health benefits of green tea are due to certain components like flavonoids, polyphenols (particularly catechins), tocopherols and some phytochemical compounds. Myth: Green tea - a short cut for losing weight! Fact: Green tea is believed to increase the metabolic rate by around 4%, but that is not enough for reducing weight. One cannot lose weight by drinking green tea alone, but by following a well balanced diet and a healthy lifestyle one can. Myth: No harm in unlimited consumption of green tea. Drink the regular hot green tea or iced green tea. Green tea extract can be added to the salad dressings (goes well with vinegar and olive oil) - can be used for vegetable, chicken and fish salads. Brewed green tea, honey and lemon juice makes a tangy sauce for grilled chicken or fish. Add a teaspoon of green tea powder to the yoghurt/curd for a different flavour. Green tea powder can be used while preparing ice creams, puddings, cream cakes and smoothies (if you like the taste). Green tea tastes good with milk too, try using it to prepare a latte. Green tea extract can also be added to the dip and spreads served with garlic bread.